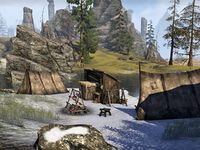 Thane Jeggi's Drinking Hole is a small camp located on the river east of Cradlecrush in western Eastmarch. It consists of a small hut next to a campfire, along with two tents. There are two crates, a barrel, two baskets and two backpacks, as well as a sack and a bottle. It is named after Thane Jeggi Gap-Tooth. Vastaag Cold-Raven mentions the place in dialogue. This page was last modified on 19 November 2018, at 05:58.